Windows 8 and 10 consolidate various boot options into a single screen named the “Advanced Options” menu. 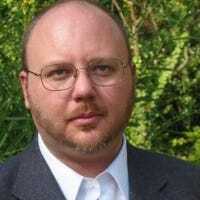 This menu provides access to repair tools and options for changing Windows startup behavior—such as enabling debugging, booting into safe mode, and launching into a recovery environment. Note: We’re showing screenshots from Windows 10 in this article, but the process is largely the same in Windows 8. We’ll point out any differences. System Restore: Launches the System Restore utility, which lets you fix certain types of crashes and errors by restoring your settings, drivers, and apps to a restore point that was created earlier. Check out our guide to using System Restore for more information. System Image Recovery: Lets you restore a backup image of your PC. 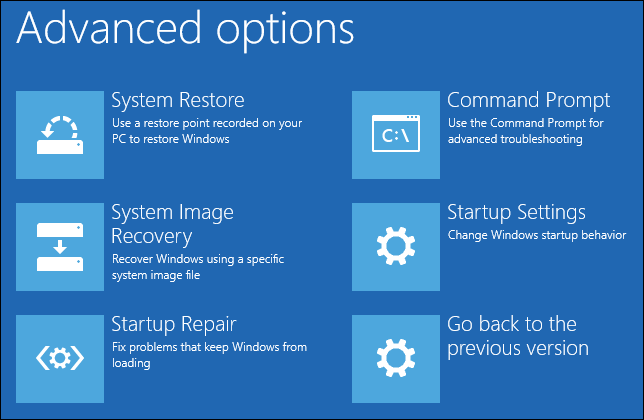 Check out our guide on restoring system image backups in Windows for details. Startup Repair: Launches Windows’ integrated startup repair tool, which tries to automatically fix startup problems. 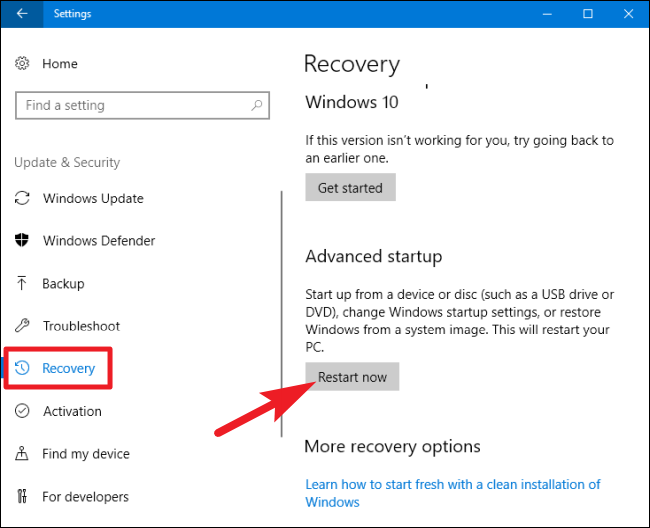 Check out our guides on fixing startup problems with the Windows startup repair tool and on what to do when Windows won’t boot for more information. Command Prompt: Restarts your PC and loads a simple Command Prompt window for troubleshooting. Startup Settings: Lets you access alternative startup modes and tools, like Safe Mode, Low-Resolution Video Mode, and boot logging. Go back to the previous version: Lets you uninstall Windows and downgrade back to the previous version you were using, as long as you’ve upgraded within the last 30 days. Check out our guide to uninstalling Windows 10 and downgrading to Windows 7 or 8.1 for more details. After choosing most of these options, Windows restarts and then loads into the mode (or starts the tool) you selected. And now that you know what you can use the “Advanced Options” menu for, let’s take a look at how to get to it. 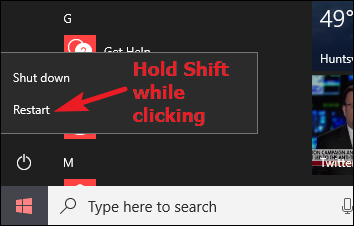 If your PC can start Windows normally, you can get to the “Advanced Options” menu quickly by just holding down the Shift key while clicking the “Restart” option. 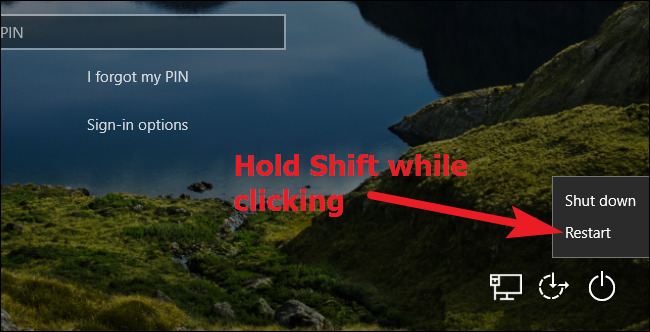 You can do this either on the sign in screen (shown above) or on the Start menu (shown below). When you do this, your PC doesn’t immediately restart. 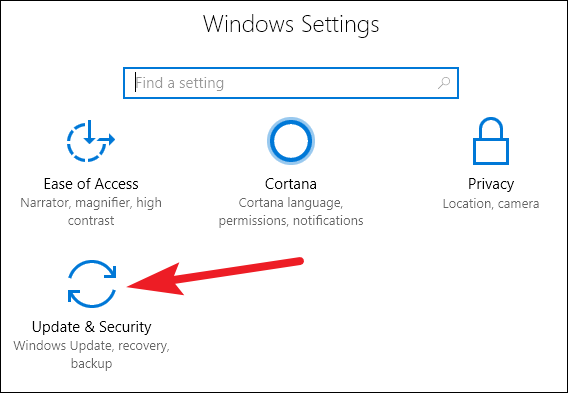 Instead, it shows you a menu that lets you continue in your Windows session, access troubleshooting tools, or turn off your PC. Click the “Troubleshoot” button. 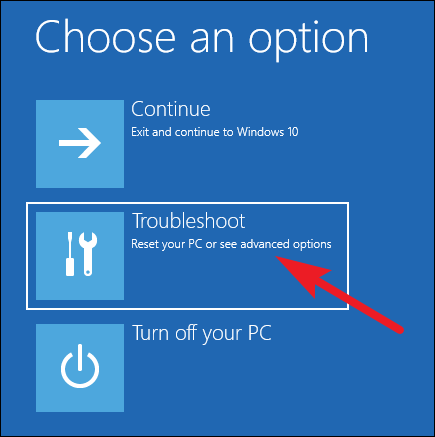 On the “Troubleshoot” screen, click the “Advanced Options” button. And, finally, you’ll arrive at the “Advanced Options” menu. 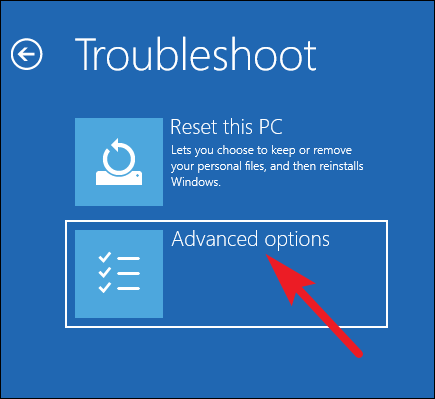 Note that if your PC can’t start Windows normally twice in a row, it should show you the “Advanced Options” menu automatically. If it doesn’t, you can try booting your PC with a USB recovery drive. Click the “Update & Security” option. In the left pane, switch to the “Recovery” tab. In the right pane, scroll down a bit, and then click the “Restart Now” button in the “Advanced Startup” section. 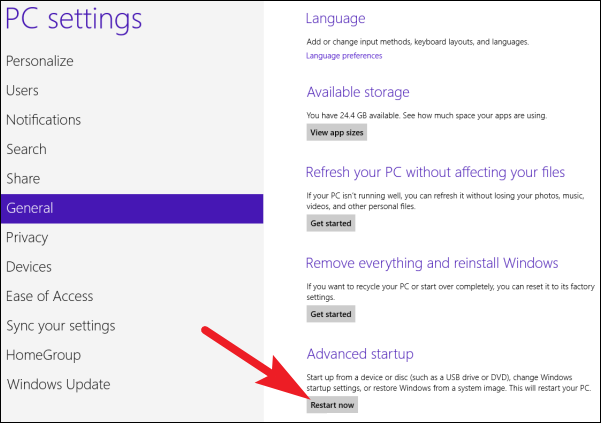 If you’re using Windows 8, you’ll switch to the “General” tab instead, and then click the “Restart” button in the “Advanced Startup” section. You can also reach the “Advanced Options” menu by issuing a simple command using PowerShell or the Command Prompt. We’re going to use PowerShell here, but it’s the exact same command either way. You could also create a batch script with this command, so that you could access the “Advanced Options” menu in the future more easily. 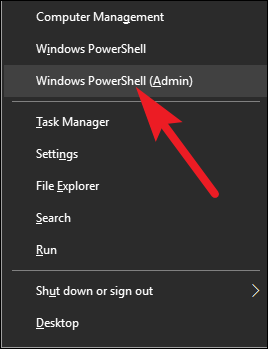 Start PowerShell as administrator by hitting Windows+X, and then clicking the “Windows PowerShell (Admin)” option on the Power User menu. A message pops up, warning you that you are about to be signed off. Windows then restarts automatically about a minute later, and delivers you to the “Advanced Options” menu.